But I got to looking at what I'd put out there and it was/is confusing. So I've tentatively revised things and I'd like you to take a look at it. Previously the pages looked like what is shown below. With the exception of the Rear Axle Vents, I think the new info on the Driveshafts page replaces all of the ones below. Do you agree? Just for S&G I tried looking up Darth's original and it should be under 80/86 F350 2WD, 7.5L C6 168" WB, ok found that then there are notes that don't exist. Interesting, very interesting as used to be said on Laugh-in. Bill - That was Arte Johnson. Anyway, I don't understand about the notes that don't exist. 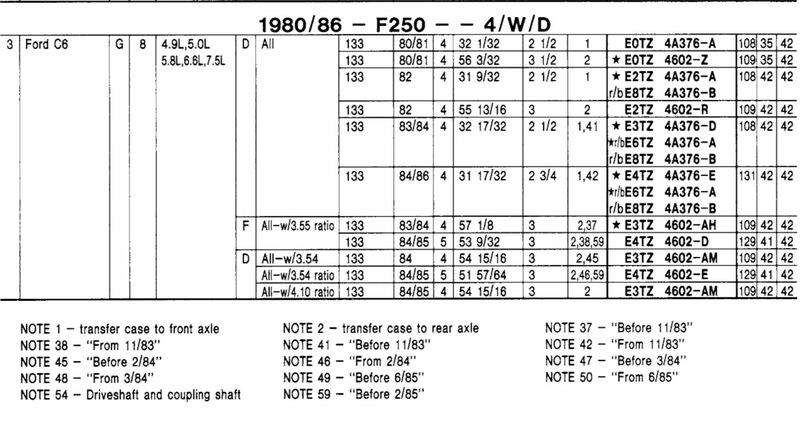 If you go to the new Driveshafts page and the Applications tab it says the 1980/86 F350 2wd's are on Page 31. Here's a screen grab from the bottom of that page, replete with notes. Did you go to the old page? I looked for my truck also. Found everything, I think. I have the 155" WB, Super Cab. I'm sure I checked and I have a NP 208 Transfer Case. The notes only referenced the BW 1345 and BW 1356. I agree that it shows either the 1345 or 1356. And I can't seem to prove it from the Transfer Case page, but I am pretty sure that all 460's got the 1345 or 1356. As per the discussion on Dad's Truck Build, the NP208 and the BW1345 are interchangeable. Any chance yours has been changed out? First, Darth is 2WD not 4WD, no factory DRW trucks were 4WD in 1986. Here is the screen grab from what should be where Darth's would be listed. 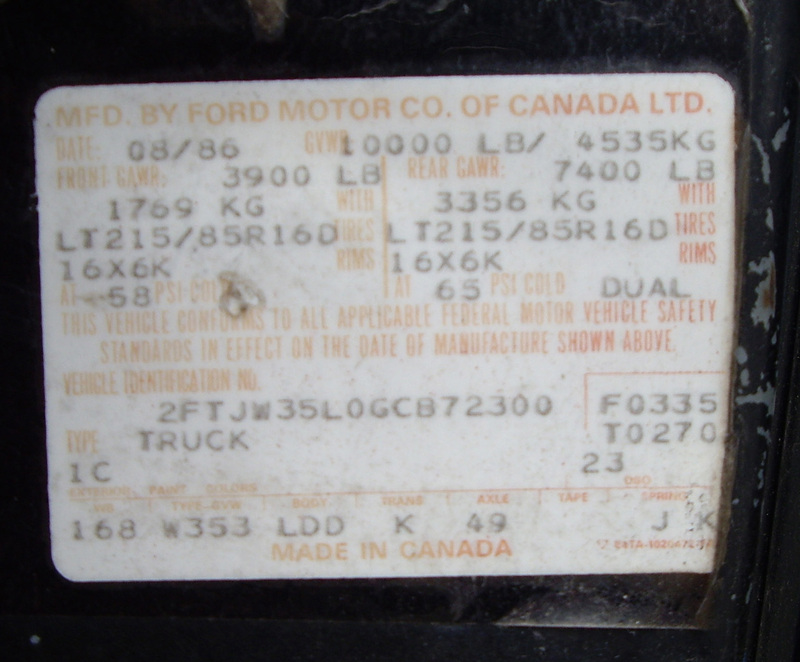 7.5L, C6, Ford 10.25" 3.55 rear, 168" WB 86 year built 08/86 at Oakville Ontario assembly plant. Bill - I think the penny just dropped. You said " there are notes that don't exist", and I was looking at the Notes column and checking to see if there's a number in there that isn't included at the bottom of the page. Instead, I think you meant that your truck doesn't exist in the listing. That it just says "85" and not "85/86" in the row where your truck should be. What I can do is edit the page and make it show "85/86" if you can confirm that the rest of the info in that row is correct for Darth. I know you said in another post that you are going to be busy, so that may not happen soon. I am going to be busy as of tomorrow with Janey's recovery, so understand. Just check it out when you can, please. All - No one has said that they dislike the new approach. In fact, no one has even mentioned the approach, just the details. But, the details are directly from the MPC. So while we can edit the details if they are wrong, as discussed with Bill, I'm also concerned with how the new approach works. I need to eliminate the old pages (actually redirect their URL's to the new page) if we agree that's the way to go. Gary, I think the approach its self is great. I was simply using what I knew to compare it to. Sorry if it wasn't easy to find. Since the list itself is from Ford's information, maybe it was just never updated? The listing for 85 says note 64, I couldn't find note 64 on either screen grab. Go up a page or two and notes 63 and 64 are there. Glad you like the new approach. Sorry! I like the approach. If I can find stuff it's good! One thing I did notice, I can actually find the original front and rear halves PNs and the updated front PN (after E4OD install). You can probably do the same and actually find a Ford PN for what you will be using in Dad's truck with the E4OD and transfer case since the front one needs to be longer and the rear one shorter by about 3" if I remember my measurements on the E4OD vs C6. Grumpin - I'll keep my eyes open for where I saw, or think I saw, that the 460's didn't get a 208. But, oddly enough, I can't find those in the crossreference where the lengths are shown. 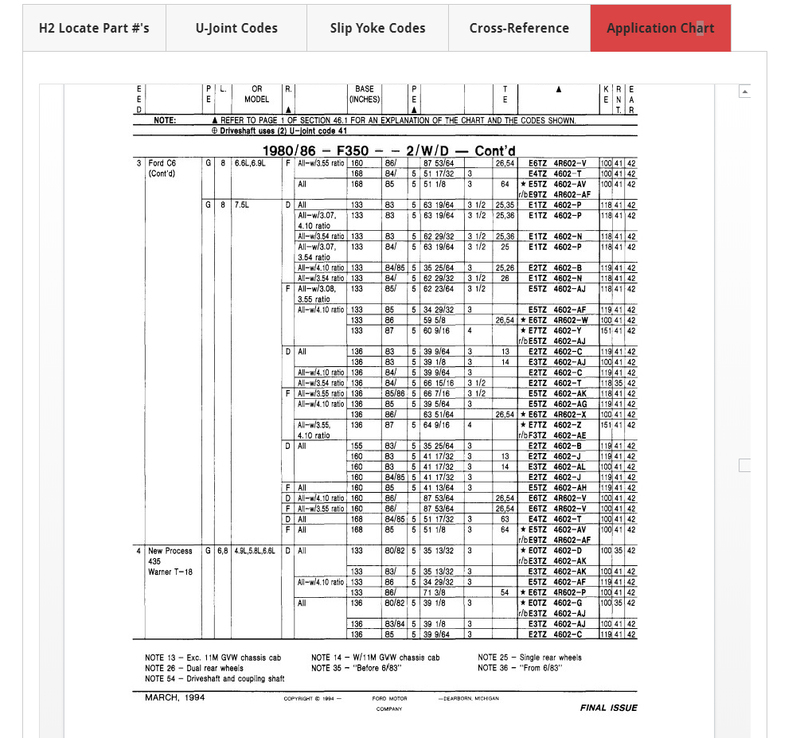 Its as if the application page is a later edition than the crossref. And, I pulled the driveshafts out that came on Huck. Unfortunately the rear shaft uses a slip yoke and I had the BW1356 set up with a yoke for a u-joint, which is what Dad's NP208 has. So, do I have the NP208 rebuilt, including having the small crack welded up, convert the 1356 to slip yoke, or find another driveshaft that is the right length? I think find another driveshaft that fits or have a driveshaft sized for your 1356. I think that has significantly simplified that area as well as provided more information. Thanks for your help. Grumpin - Ok, thanks. But let's take the driveshaft/t-case discussion over to Dad's Truck Build.